Andrew Washington, 21, died in Vallejo police custody after foot chase and tasering, 9/15/2004. 2nd death in custody of Vallejo police that week. I also added this one to the database. He had been my housemate. Michael David Roehl, a 38-year old homeless man from San Francisco, was killed by police in Orange, California, on March 21, 2003. Officers' reports of the incident varied- either Roehl was pointing a gun that later turned out to be a toy at them, or he refused to take his hands out of his pockets. 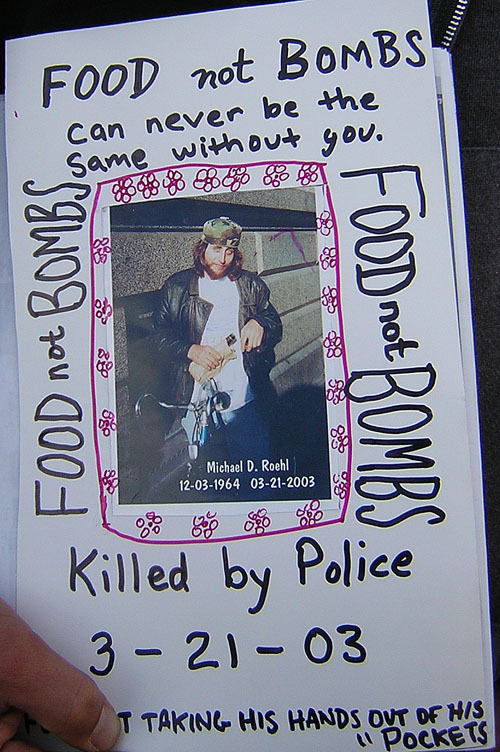 Myky had been an amateur inventor and an activist with San Francisco Food Not Bombs. He is survived by friends, former housemates, and his cat. I went into the list up above and corrected the date on which Gustavus Rugley was killed: 6/29/04, not 6/30/04. Thanks to his mother and his girlfriend for correcting that. Bich Cau Tran, shot and killed by Chad Marshall SJPD on July 13, 2003, while standing in her house in the kitchen holding a vegetable peeler. not quite sure how she didn't get included on the list we made last year. Relevant information. Now many were unjustified? Police shouldnt exist so all of them are Murders. Do you smoke crack????? This world would be like a scene from Mad Max. Did you even see the picture of that "vegitable peeler?" We here in AMERICA call it a meat clever. A big metal hatchet for chopping through UUHHH meat. It was not what we AMERICANS use to peel vegitables. It was over 12 inches long with a 6 inch by 4 inch sharp heavy blade. You hold that over your head and walk towards me yelling and I would shot to. No Steve I dont, do you smoke crack? You didnt like Mad Max?